As part of Mananeeya Ekanathji Janma Shati Parva, Samidha (Gathering of Karyakartas) was organised at palitana on 19/11/2015 at Model School Palitana. Shri Nivedita didi - Vice President of Vivekananda Kendra, Ma. 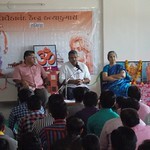 Kishorji - Joint General Secretary of Vivekananda Kendra and Srri Rajendrasinhji Rana were special guest in the program. Around 100 karyakartas participated in the program. There was guiding session of Niveditadidi followed by experience sharing of Karyakartas.